1. Boil colocasia root in sufficient water till soft. Let it cool down. 2. Peel and mash it. 3. Combine mashed colocasia root, onion, chili powder, garam masala, chat masala, green chilies, minced ginger, coriander leaves, mango powder, ajwain, asafoetida and salt. Mix well. 4. Finally add bread crumbs and mix well (for binding). 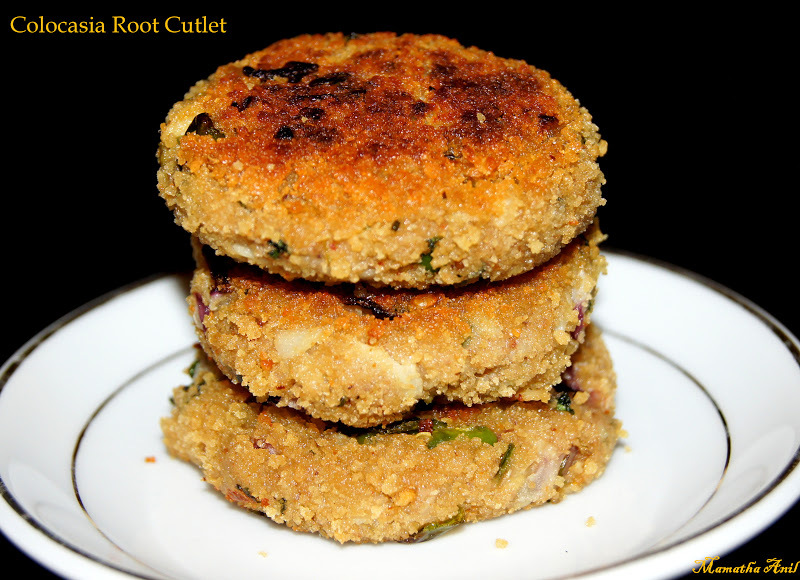 Make small balls, roll over bread crumbs and press to make cutlets. 5. Heat 2-3 tsp oil in a non stick frying pan, fry the cutlets on medium heat till the bottom turns brown. Flip and cook the other side. Remove from heat and place them on a paper towel. 6. Serve cutlets with any chutney or ketchup.